Just the other day, a reader asked me about how blogging was helping us to reach our financial goals and what advice I have for people who are thinking about starting a blog for personal accountability. Readers often ask advice on starting a blog, especially a blog to chronicle their financial journey. I always hesitate to talk too much about blogging specifically since most of my readers aren’t bloggers. However, most of my readers do have goals! A blog doesn’t have to be a huge business undertaking. Even a simple private blog can be motivating and encouraging for whatever goal you are working toward. Whether your goal is to get out of debt or to lose weight, a blog can be a great way to stay accountable. I’ll start with my own experience to show how blogging for accountability has helped us specifically. Document our debt repayment progress— It’s a great way to see how far we’ve come and is a journal of our journey. Keep ourselves motivated and accountable— Knowing we’ll be sharing everything keeps us on track. Share money-saving and budgeting tips, ideas, and tutorials— We were frugal way before it was cool, so we’ve got lots to share. Motivate others in similar situations— Isn’t it nice to know you’re not alone? Eventually make money— Having read blogs for a decade before starting mine, I knew from the start that this was possible. Put simply, my blog is fulfilling all of the original purposes I had hoped for. More specifically, here’s how Six Figures Under has helped us with our goal in each of these areas. 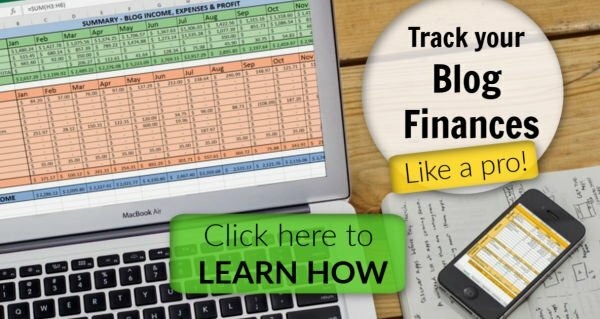 Documenting— As part of documenting the progress toward our enormous financial goal, I publish a “Debt Repayment Progress Report” each month that tells what we earned, spent, and paid in debt. I actually love creating the report each month (and it’s a favorite with readers too). Motivation and Accountability— Knowing that I’ll be sharing all my numbers with you each month really helps keep me on track. I think twice about spending money and want to live up to everything I “preach” about frugality. I don’t want to let down people I know are cheering for us. That’s what an accountability partner is all about. Letting the world know about our audacious (and seemingly impossible goal) is really motivating for me. I don’t want to back down and I don’t want to fail, so we just keep pushing along doing our best. Sharing— Helping people get their finances in order is something I’m passionate about, so I never get tired of it. In real life, it’s not socially acceptable to spout out financial advice to everyone you meet, so blogging gives me an outlet to share my ideas and perspective on money. Both my husband and I come from frugal families, so we already have lots of frugal ideas and money-saving habits. Even so, I am always on the lookout for more ways to be thrifty to try out and share with my readers. Motivate Others— I get emails and comments all the time from readers who are in similar financial situations and are so happy to connect with someone who is in the same boat. I am generally a positive, upbeat person, so it’s natural to be enthusiastic and encourage others. Make Money— There is a reason this is number five and not number one. Anyone who has a successful blog will tell you that if your only objective is to make money, you will fail. It’s way too much work to put in (often with no monetary returns for a long time) if you’re just in it for the money. It probably goes without saying that the income from this blog is really helping us get closer to paying off our student loans. Your objectives for your accountability blog will likely be different than mine. Clearly thinking through your purposes in starting a blog will help you determine what kind of blog to start, how much energy to invest in it, and what you hope to get out of it. Maybe you only want to share your weight loss journey with a few close friends and family members. If you don’t want to share your story with the entire world wide web, but just with some select individuals, that’s possible. If you start your blog with Blogger, you can choose to have your blog be private. From the Blogger.com dashboard, go to Settings > Basic > Blog Readers > Private- Only These Readers. To invite others to read your blog, you can enter their email address and they will receive an invitation to read your blog. You have complete control over who has access by invitation (up to 100 people). Are you thinking about starting a blog to chart your debt repayment progress, but don’t want it linked with your name or image? That’s fine too. You aren’t required to publish your name or face on your blog. You can always change your mind later if you decided to open up. To blog anonymously, you will probably want to set up a new Gmail account for your blog and use Blogger through that new address. If you don’t want to be private or anonymous, you can share your journey with everyone. While someone who is blogging anonymously can change their mind and go public, it’s hard (or impossible) to go the other way. Once the information has been published, your virtual footprint is there for good (or at least you should act as if it is). Before you decide to take your accountability journal public, be sure that anyone else who is affected (i.e. your spouse) is fine with your sharing the information. If you have any plans to make money from your blog in the future, set your blog up to make that as simple as possible. Even if you don’t plan to monetize your blog right away, you should have the framework set up for it from the beginning. Specifically, you’ll want to have your blog be self-hosted on the WordPress.org platform. That means that you will have to shell out a little bit of money in the beginning. Even so, you really can start a blog on a limited budget. Because making money was on my radar from the beginning, I set up my blog to make this possible. I created a self-hosted blog on WordPress.org (which is different than setting up a free site at WordPress.com). Self-hosted means that you pay to have your site hosted somewhere. I host SixFiguresUnder.com with Bluehost. There is a step-by-step tutorial for setting up a self-hosted blog and installing WordPress if you’re ready to get started. One of the reasons I was able to start being successful early on was because I learned the ins and outs of blogging by reading How To Blog For Profit: Without Selling Your Soul . Ruth’s insight and focus in this book will really help you build a successful blog from the start. If you are committed to earning an income blogging, I highly recommend signing up for Elite Blog Academy. Registration is only open once or twice a year and it is pricey, but it is well worth the investment! Another great resource that I have found helpful is Abby Lawson’s Building a Framework. It’s especially geared toward beginning bloggers and isn’t anywhere near as expensive as other comparable courses. It’s packed with practical how-tos to help you set up an awesome blog. We have felt so much love and encouragement as we have shared our goals and our journey with the world via this blog. 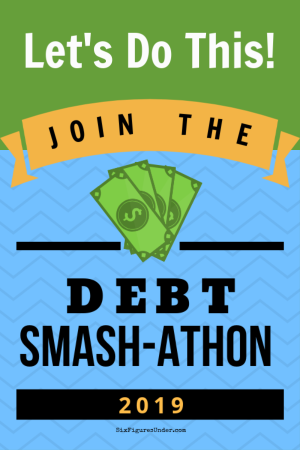 We have definitely made more progress toward our goal of being debt-free than we would have without the blog. I have made friends who I am cheering along on their journeys. So many good things have come from starting this blog. That being said, for every 999 kind and encouraging people, there is always one who is just the opposite. They are few and far between, but some people will leave rude and downright mean comments. When you put yourself out there and make yourself vulnerable, you have to have thick skin. Just be prepared that not everyone will comment with encouragement. If you can look past the meanness you can sometimes find valid criticism that can help you improve. Some of you have been curious about how I make money with my blog and how that income breaks down by monetization type (ads, affiliates, sponsors, etc). I’ve decided to share my blogging details (income breakdown, tips, answers to your burning blogging questions, etc) via email. If you are interested, then please sign up for my Behind-the-Scenes Blogging emails! Do you blog to keep yourself accountable? Do you really know your readers? I was shocked by the results of my first reader survey! The surprises I encountered have changed my strategy to grow my blog! Unfortunately, I waited 3 years to discover these secrets. That's way too long! Don't make my mistakes! You'll get all the details in the Reader Survey Surprises report. Plus, you'll get my Behind-the-Scenes Blogging emails where I share monthly blogging income and expense reports, blogging tips, and encouragement! « What are your kids learning from you about money? I started my blog to share tips, start a side business ( to help pay off debt), and to be accountable. When you post goals for the world to see if gives you an extra kick to get things done. I have read your blog severa times and always enjoy what I read. Keep up the good work. I totally agree! Making a goal public definitely increases your drive to get it done. I recently started my blog after making some difficult (but amazing now that they’re done!) decisions to change and eliminate our 500k in debt. Now we’re about halfway done and it’s been really helpful to know that if I blow it, I have to make it public! Wow! Halfway done is amazing! Way to go! I do blog for accountability – but mainly on my grocery budget. The rest of the time, like you, I hope to share the frugal ideas I’m living with others, because I know those close to me don’t want to hear it all the time! 🙂 I’m glad your blog is helping you make progress toward your debt repayment goal! I bet the people around us are glad we blog (whether they know it or not), so we don’t have to talk their ears off about all that’s on our mind! That is rough when you aren’t on the same page Joanne. I’m sorry that it’s so frustrating and hard for you. It will probably take some giving on both sides. You’ll definitely have to compromise. It sounds like he really resists when the topic comes up. He doesn’t like being told what to do or forced into your plan. Letting up a little might be the best thing for your marriage. Do you have some ideas of what would motivate him? Has he thought about retirement at all? That might be a good motivator to get your finances in order. For right now, I’d suggest doing the best you can on your own (for whatever things you have control over) and give him some space. Maybe with some motivation, he’ll come around on his own. I always love reading your debt repayment updates! They are certainly one of my favorite posts. I blog to share thoughts on faith, family, and frugal living. I have loved learning from other people as they share what works in their families, and I wanted to contribute to the conversation. Thanks Sarah! Those are great topics to blog about! I love this! The only other thing I would add is to write something YOU care about and would like to read, rather than just what you think others are looking for or will make you money. I find that the posts I enjoy writing the most are usually the ones that other people enjoy too because my enthusiasm shows through. When I’m struggling with a post, it’s usually due to me trying to write about something I’m not excited over or don’t care about very much OR I’m trying to imitate or adopt the tone of another blogger that I admire instead of just being myself. I have been trying to decide if i want to start a blog for a while now, I think it would be fun and nice to have the possibility of earning money eventually, but sometimes I have a tendency to doubt myself. I need to find a way to just start something and take the plunge into trying something new. Great post. I couldn’t agree more, blogging not only motivates others but writing and sharing ideas motivate yourself. Here a tought about blogs and accountability ; To increase the consistency of our motivation we should use these finite periods of determination to create platforms which keep us accountable (consider it like an asset that produces motivation).